Safeway has been in business since 1915. After over 100 years, it’s surely learned a thing or two about baking cakes along the way. Indeed, the company has an established reputation for value, affordability, and variety. This review will put that reputation to the test. Most bakeries are known for more than cakes, of course, and Safeway is no exception. Before looking specifically at the cakes, let’s get a closer look at the bakery as a whole. In addition to decorated cakes, it also specializes in artisan breads, donuts, and bagels. For those with food sensitivities, Safeway offers a selection of cookies, donuts, and breads that is gluten free. It’s also worth mentioning that, because Safeway is a large international chain, your encounter in any one local store, whether positive or negative, may not be reflective of the chain as a whole. This review will attempt to gauge factors that should be universal across the entire chain, but bear in mind that your individual experience may vary. Safeway cakes come in an array of sizes but four basic shapes. 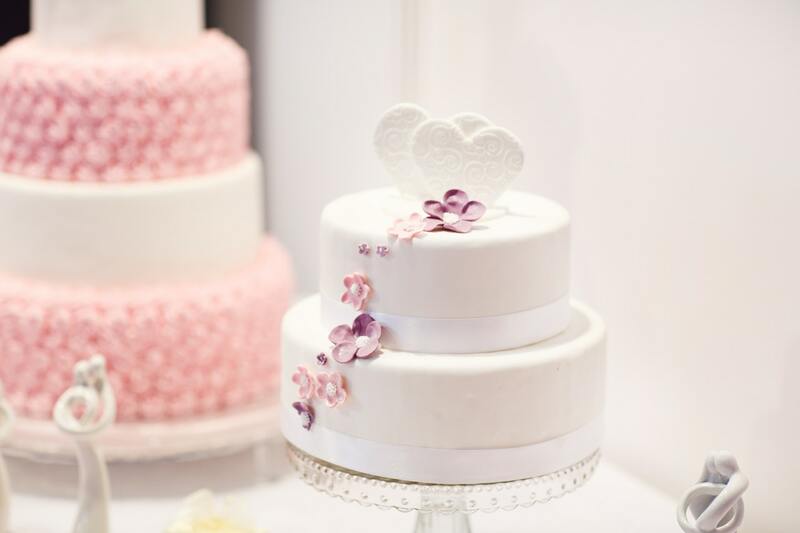 The least expensive is the 8-inch round cake, and the most expensive is the three-tier wedding cake. Safeway also sells sheet cakes and cupcake cakes. A cupcake cake is a relatively new fad in which a batch of cupcakes is grouped together on a single or multi-tiered tray and decorated with a unified design to give the illusion of a single decorated cake. 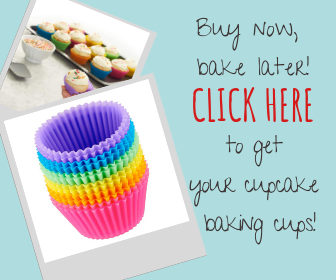 Cupcake cakes are popular for kids’ birthday parties, baby showers, and perhaps even a small, casual wedding. Safeway’s cupcake cakes come in batches of either 12 or 24. 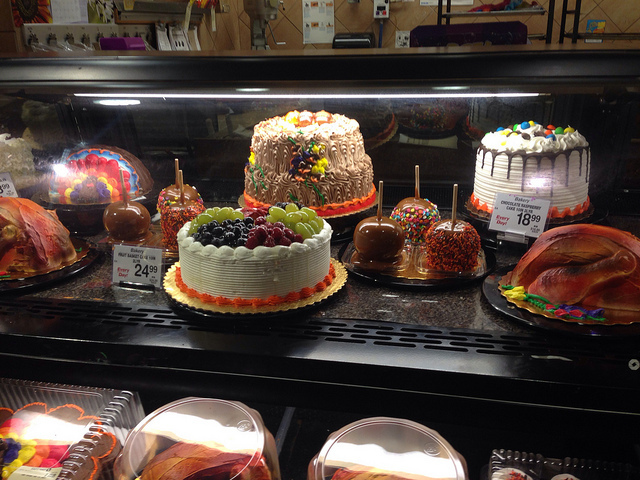 While Safeway has a wide selection of decorated cakes already available, their cakes are also customizable. This means that you can choose a premade cake and add a celebratory message, or you can design a cake according to your own preferences. Before we take a look at some of the designs, keep in mind that these are store specific. That is, not all decorations will be available at every Safeway location, and even if the options you want are offered, they may not be in stock at the time you order. Be sure to check and see what your specific store has on hand. Weddings: Safeway wedding cakes come in either three-tier or two-tier varieties. The tiers can be square or round. Cakes can be embellished with flowers, ribbons, or other accoutrements. Icing comes in different hues, not just white, so it may be possible to coordinate your cake with your wedding colors. 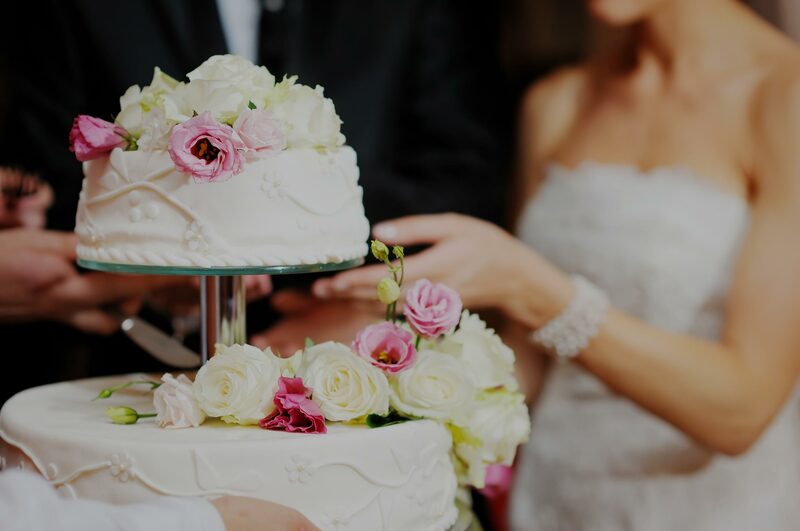 If your wedding is small, or if you’re on a tight budget, a round cake or sheet cake will serve your purpose, and these are also customizable to a certain extent. 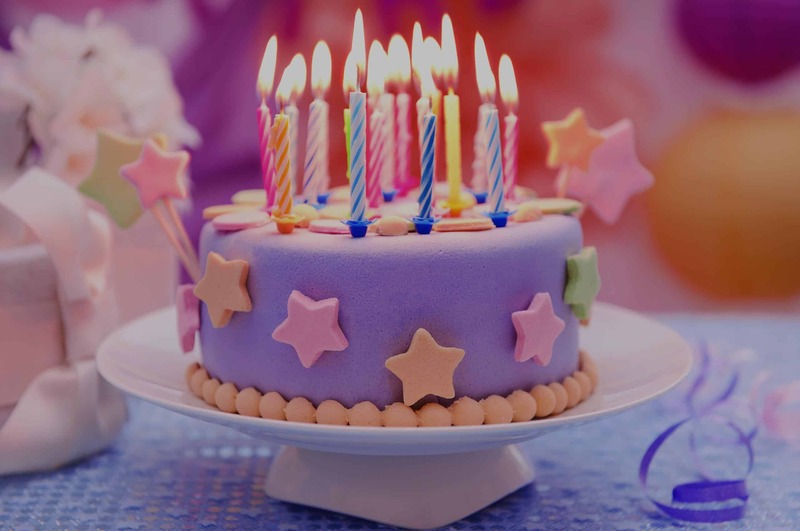 Kids’ Birthdays: Most Safeway stores can decorate your child’s birthday cake based on the party’s theme, whether that be your child’s favorite hobby, toy, or TV/movie/comic book characters. You can order the cake with the design illustrated on it. Safeway also offers small figurines that sit atop your cake and give the design a three-dimensional aspect, although this will cost you extra. Be aware, also, that these figures are small and made of plastic, so they pose a potential choking hazard for children under the age of 3. Graduations: A sheet or round cake will most likely serve your needs for a graduation party, although a cupcake cake may also be fun. As with the kids’ birthday cakes, most stores should have graduation-themed decorations available (graduation cap decals, a rolled diploma, the school’s mascot, etc.) In most instances, you should also be able to customize your cake by having it iced in the school’s colors. As with decorations, the cake flavors and fillings offered will vary at individual stores, so be sure to ask before you buy. The popular standbys of chocolate and vanilla are pretty safe bets; therefore, so is marble cake, in which the two are combined. 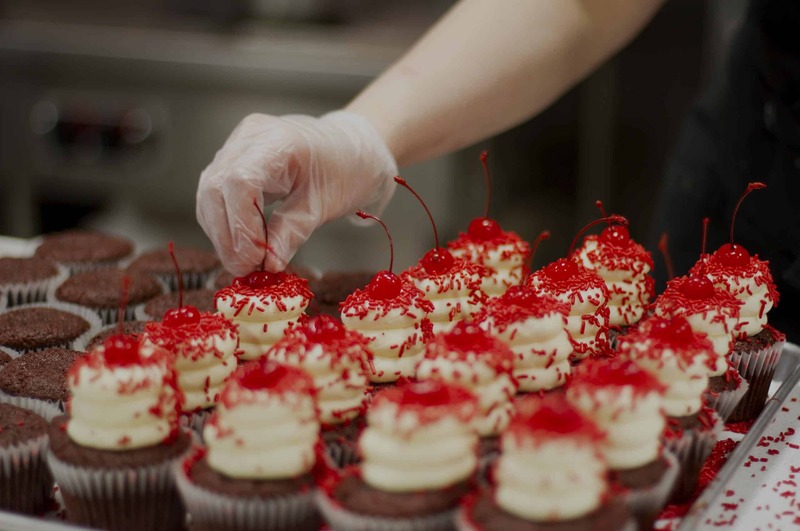 German chocolate and red velvet are popular variants that should also be available. 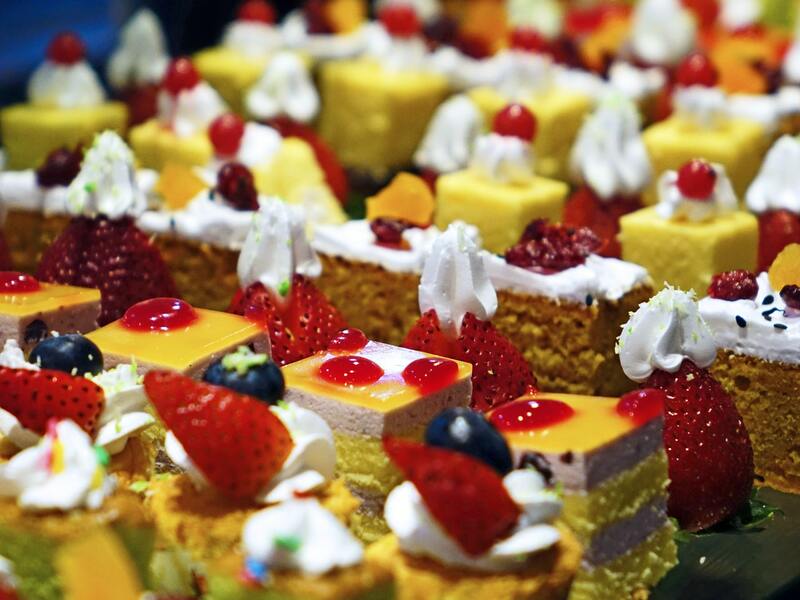 Lemon crème, custard, or even ice cream may be available as fillings, and fresh fruit can be used as either a filling or a topping. If you have your heart set on a particular customization, never be shy about asking Safeway employees if the store has it. The worst they can say is no, and they may even be able to offer you something similar as an alternative. In order to get a more complete picture, we compared Safeway’s cakes with those from three of its closest competitors: Wal-Mart, Super Target, and Costco. Generally speaking, Wal-Mart’s bakery offerings are almost identical to Safeway’s in regard to cake sizes, shapes, fillings, flavors, designs, and decorations. Wal-Mart and Safeway each offer traditional buttercream and whipped “bettercream” icings. Both also make vegan cakes and give you the option of printing a custom photograph directly on the cake. Wal-Mart has more fillings and flavors listed, but Safeway may offer those same options, since the selections vary by store. The one thing that Wal-Mart sells that Safeway doesn’t, according to our research, is a “party combo” that includes both a small cake and a dozen cupcakes. This appears to be a distinct product from the cupcake cake. The primary difference between Wal-Mart cakes and Safeway cakes appears to be the price. Wal-Mart offers the same sizes, shapes, and variations of cakes but generally undercuts Safeway on the prices. In fact, there is only one cake that Safeway sells for less than Wal-Mart does. That’s the three-tier wedding cake, which sells for $140 at Wal-Mart and $119.99 at Safeway. With that said, in most cases the savings on Wal-Mart’s cakes are minimal. The exceptions are sheet cakes, which can be anywhere from nine to 16 dollars cheaper at Wal-Mart, and the two-tiered wedding cake, which averages a whopping 32 dollars cheaper at Wal-Mart. Wal-Mart’s ordering process is a little more convenient than Safeway’s is. Neither of them offer an online order form, but Wal-Mart does have a printable order form on its website that you can fill out and take to the store, streamlining the process slightly. Wal-Mart requires at least 24 hours advance notice when ordering a cake (longer if it’s a wedding cake), and that’s a good guideline to follow when ordering cakes from Safeway as well. Super Target is a “hypermarket” that includes a full grocery store and a department store in one. Be sure to note the difference between a regular Target store and a Super Target, as regular Target stores do not have a bakery department. Generally speaking, Super Target sells fewer sizes and shapes of cakes than Safeway or Wal-Mart does. No tiered wedding cakes are offered at all, and unlike the other two stores, Super Target does not have a 1/8 sheet cake. Therefore, you have fewer options right off the bat. For most cakes, Super Target offers some savings over Safeway. Super Target’s 1/4 sheet cake costs $19.99, the same price as Safeway’s 1/8 sheet cake, and Super Target’s 1/2 sheet cake actually costs $27.99, making it slightly less expensive than Safeway’s 1/4 sheet cake. If you’re looking for a smaller cake, though, Super Target’s one-layer, 8-inch round cake costs $9.99, slightly more than Safeway’s similar option does. Once again, Super Target’s options for flavor, fillings, and decorations are comparable to Safeway’s and Wal-Mart’s. Where Super Target is lacking is with regard to designated wedding cakes. While you can still customize one of the other cake varieties with wedding-appropriate decorations, there are no tiered options. Super Target doesn’t offer online ordering either, so you have to go to the store in person. If you happen to have a Super Target in your area, this is a serviceable option, but the relative paucity of variety may not make it worth your time. When it comes to cakes, Costco does one thing and does it well. It only offers one size and shape of cake: a 1/2 sheet cake that serves approximately 48 people. However, this 1/2 sheet cake costs $19.99, making it considerably less expensive than the other 1/2 sheet cakes on this list, although a couple of specialty cakes cost more. If a 1/2 sheet cake is what you’re looking for, Costco offers the best value. Costco offers many decorative designs that can be iced onto cakes, but it doesn’t offer photo printing or the little plastic props that you can get from Safeway and Wal-Mart. It is also unclear whether licensed characters are included in the Costco designs; the available designs listed seem to be rather generic. If you live in the UK or Australia, you are afforded the convenience of ordering your Costco cake online. Otherwise, you will have to print and fill out your Costco order form and take it with you to the store. Also note that Costco is a warehouse club, which means that you will not be able to make a bakery purchase from the store unless you are a member. Safeway cakes rate highly compared to competitors when it comes to the variety and customizability of the cakes available. Safeway also offers some versatility when it comes to ordering, as it allows you to order cakes in store or by phone. However, some may prefer the convenience of the order forms provided by some of the competitors. In areas where Safeway delivers groceries to customers’ homes, you may be able to get your cake delivered as well, which is a major advantage where available. Be sure to check first whether your cake can be delivered or if you need to pick it up. With regard to price, Safeway is on the higher end of the scale compared to competitors. However, only Wal-Mart edges Safeway in this regard, as the others are impeded by the limited options that they offer in terms of size and variety. 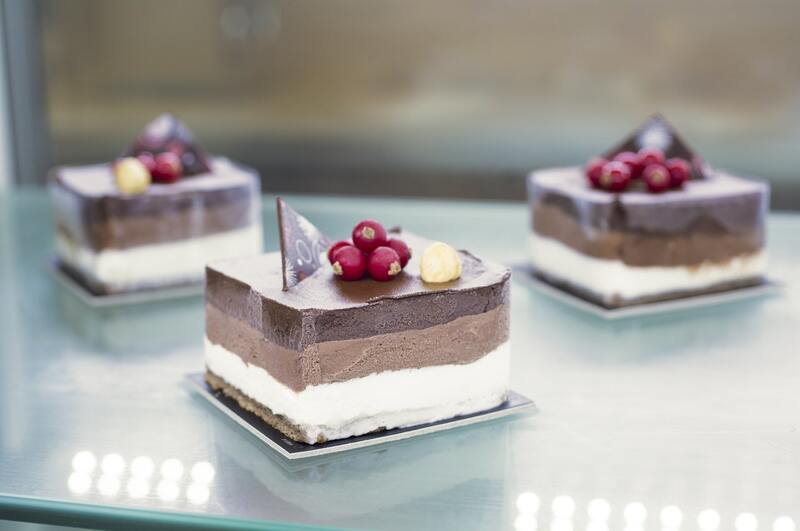 Safeway offers excellent value for the money in terms of the variety and customizability of its cakes. Its only real competitor in that regard is Wal-Mart, which frequently undercuts Safeway’s prices. However, depending on the type of cake you want, the overall savings may be miniscule, and in some cases Safeway may actually have the better price. When choosing between Safeway and Wal-Mart, it may just come down to a matter of individual taste, which is something you will have to determine on your own. The best advice that we can offer is to figure out what you want beforehand, then talk to the bakers at both stores to see which store offers what you want, or the closest thing to it. Make sure to talk to the bakers rather than just looking at the sample books, because the books may be out of date, and there may be options available that are not listed in them. Also, ask if you can taste a free sample, because if you like the taste of one store’s cake over the other, that may just tip the balance.